Wat Benchamabophit Dusitvanaram (simply called Wat Benchamabophit) or known as "The Marble Temple" is designed symmetrically with multiple layered roofs and beautifully balanced proportions. 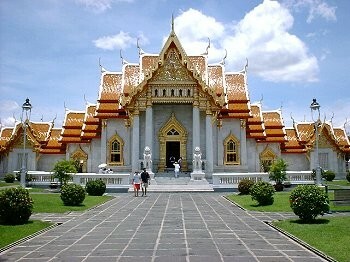 It was constructed in 1899 in the Dusit area of Bangkok, an area that bristles with 19th century buildings. The Ubosot Hall (Bot or Ordination Hall) was constructed from Carrara marble from Italy and showing distinct European neo-classical influence. The roofs are covered with glazed Chinese terracotta tiles. The polished, reflective surfaces of these materials and the traditional gold-lacquered ornamentations give the temple a gleaming and glistening appearance in the sunlight.